When I was in college, members of a certain scholarship program were required to attend a one-day “leadership development” seminar, in which we took a personality test and discussed—well, ourselves, mostly. Then the seminar leader made us all lie on the floor for 20 minutes in silence so that we could get in touch with the “divine spark” within us. I used the time to pray. The girl next to me fell asleep (apparently she was sparkless). This was not a religion class. The leader had conducted these seminars for people in companies all over the country. We were impressionable (okay, a bit skeptical) 19-year-olds at a secular university. And we were being fed Gnosticism. Lesson of the day: ancient heresies are alive and well in modern culture. Gone are the days when the average Christian could get away with not knowing what the Rule of Faith was or how the biblical canon developed. In recent years, the early church has become the subject of public debate and an enormous amount of confusion. The tempest over The Da Vinci Code has finally begun to subside, but the speculations and questions it raised among readers still reverberate. In 2006, a National Geographic Society documentary introduced Americans to the newly translated Gospel of Judas, painting it as a juicy subversive text and even bringing up Hitler's praise of the Oberammergau Passion Play to show where the Christian vilification of Judas led. (If only the church had listened to those tolerant, enlightened Gnostics!) Bookstores teem with authors claiming to overturn the traditional understanding of Jesus or the accepted history of the earliest church. Many current books portray Gnosticism as a vital, exciting, alternative Christianity suppressed by a power-hungry Catholic hierarchy. And it's not just a matter of bestselling novels or passing academic trends. 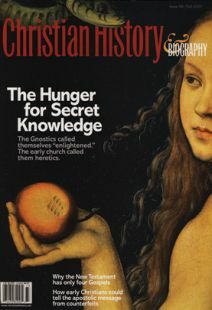 As Philip Jenkins describes in this issue, Gnostic ideas have never really died—they have cropped up in medieval heretical movements, 19th-century poetry, modern psychology, and esoteric groups like Scientology. In today's atmosphere of pick-and-choose personal religion, Gnostic-like beliefs meld easily with popular “spirituality.” After all, it's nice to hear that I'm special, that God is inside me, that the key to ultimate life is to know who I really am. Sin? Beside the point. I knew there was a good reason why Christian History & Biography exists. In this issue, we want to lay out the basic facts that will help you evaluate and respond to the dizzying array of wild theories and “evidence” in bookstores and on TV, and also to recognize Gnostic ideas when you encounter them in alternative spiritualities and popular culture. Hint: “divine spark” spells trouble.